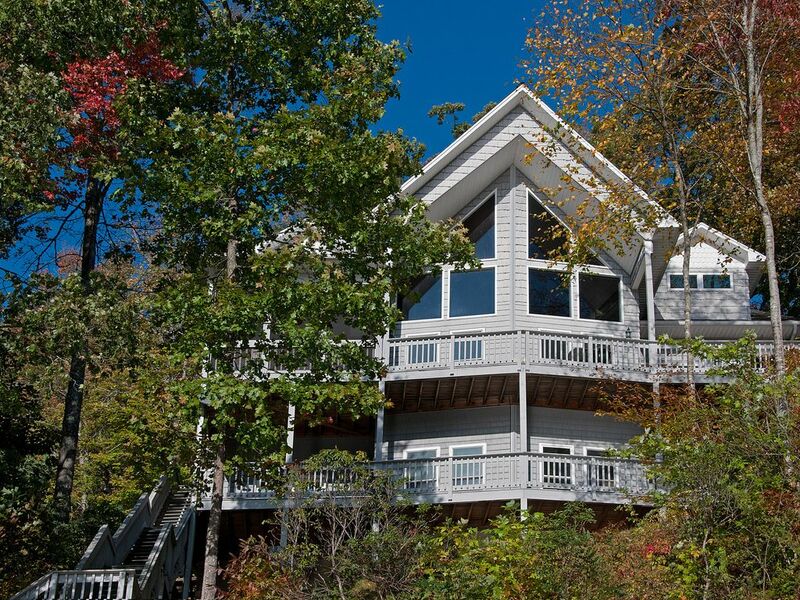 Serene , Peaceful, lake front home on Pristine Lake Nantahala. Swim, boat, play, fish in the lake - private large dock for easy access and relaxation ! Higher elevation makes our lake refreshing and pleasant even during the summer heat . cool barn doors adds additional finished bonus space ! Majestic lake and mountain views await you from this beautiful four bedroom, four bath, vacation home! Our open loft adds additional sleeping options and a comfortable seating area. We want our guests to know that their vacation enjoyment during their stay at Driftwood Cove is important to us - we strive to provide a home that is clean and true to what is represented in our listing. Reserve this Lakefront Home which is nestled in a private cove, in the central part of pristine Lake Nantahala, in the mountains of Southwest North Carolina. Our floor plan is spacious - we have 3 levels. Pull into our driveway for easy access directly to front door on main level. Hallway leads to our huge open family room. 2 Story walls of glass windows in the family room afford you a panoramic mountain and lake view. Pine cathedral ceilings and a floor to ceiling stone fireplace add to that mountain home feel. Wooden Floors in all main living spaces and new sectional sofa. To the right of family room is the dining area with beautiful rustic table with room for 10 . Double French doors lead to enclosed screened in lanai for additional seating options. Kitchen is fully equipped with lots of cabinet space, dishwasher, oven , microwave and Refrigerator. Kitchen Counter top Bar area sits an additional 4 people. 2 Full bathrooms on main floor plus 2 bedrooms off hallway. Bedroom one has private bath / queen bed, bedroom 2 faces lake /queen bed. Our decor is rustic with soothing colors for a fresh clean vibe. Upstairs there is an open loft with more seating options and a pull out sofa with a queen folding bed. The bedroom to the left has 5 individual twin beds, the other bedroom has 2 twins and one Queen mattress. There is also a full bathroom upstairs. The basement is completely finished with large open 2nd living room area, TV connection for video games , high top bar with chess and checker game top built in , second room has Ping Pong table - challenge your friends to a game of ping pong or just take time to relax and play a few board games. The basement also has incredible views of the lake and mountains. There is also an additional full bathroom in the basement. New vinyl flooring installed in 2017 plus rustic style custom barn doors. Laundry room is available for guest usage. Plenty of space to relax ,,,there 2 outdoor decks plus an enclosed screened in porch. Charcoal grill and picnic table on upper deck. Outdoor stairs allow easy access to our private Lakefront dock. Boat rentals are available at a nearby marina or you can bring your own boat and dock it right at the house. Our cove allows for a perfect area to swim and fish off the dock. We also offer use of a "canoe" which is included with the house rental. Launch your own boat in the public boat ramp close to the house (ask homeowners for information ) or rent a boat from the 2 nearby boat rentals facilities. Dock can accommodate multi boats and watercraft. Fish up the river or hire a fly fishing guide. Perfect for a family reunion or get-away with friends. C The house is equipped with Satellite TV, VCR, DVD, games and videos for your enjoyment and WiFi Internet access. Go for a swim, explore the waterfalls, hike Wayah Bold Mt. views of 5 different states from observation tower, fish at the local Trout Farm or just relax and watch the wildlife. Head to Lakes End for dinner and family fun. There are great gravel roadways to walk in community - also close to Bartram and Appalachian Trails . We are located close to Whitewater rafting on the Nantahala River, tubing, the Cherokee Indian Reserve, and the Great Smoky Mountain State Park. Lake Nantahala - Land of the Noon Day Sun's undiscovered beauty is surrounded mostly by the Nantahala Forest Preserve and some private homes . You will love the peacefulness of area and beauty of the lake. Lake Nantahala is one of the most picturesque lakes in Southeast offering 42 miles of shoreline to explore! The Nantahala area has a lot of activities to offer families. The Mountainside Theater is located about 45 minutes away in the heart of Cherokee Indian Country. The theater is famous for its production of “Unto These Hills”, which is a live re-enactment of the story behind the Cherokee Indian historic “Trail of Tears” journey. Or, hop aboard the Great Smoky Mountains Railroad for your choice of scenic family train rides or romantic gourmet dining. The Railroad also presents a Mystery Theater dinner on select Friday nights. Outdoor enthusiasts will love the nearby offerings of The Nantahala Outdoors center - white water rafting, mountain biking, skiing, and hiking. If you are adventurous you must go rafting down the Nantahala River. . And, the Tsali Recreation Area is fast becoming a “Mecca” for lovers of mountain biking. Hikers of all ages will appreciate the world famous Appalachian Trial, which you can pick up with a short drive from home. You also don’t want to miss a drive up to the top of Wayah Bald, which offers stunning views for miles of the Western North Carolina landscape. There are also horseback riding options in the area. We are the best value on the lake ! We are Floridians and Georgians that fell in love with the serenity of the mountains and Lake Nantahala - its an undiscovered gem - beautiful and peaceful. The location is unique, high elevation , clear clean lake, national forests surrounds half the lake, not a lot of boat traffic, close to whitewater rafting and hiking areas. There are very few pest bugs at this elevation. It is always 10 degrees cooler than Atlanta! Lakefront with private boat dock. Love the ability to canoe around the cove area. The living room has a wall of glass and the minute you walk into the house there is a view of lake and mountains ,,, the water front is serene and unspoiled , not a lot of commercial areas yet not isolated . You have access to gravel roads for a great walk around the lake front for miles. There is a hidden waterfall across the lake - we enjoy boating there and walking the path to the falls, taking a swim in the brisk mountain water. toilet, shower, Hallway Bath on main level with privacy door. toilet, combination tub/shower, Basement bath in finished basement. Nantahala National Forest surrounds the lake. There is a dishwasher. Starter packs for dish soap and dishwashing soap are provided. Fully stocked kitchen. Coffee filters are always available. Blue Tooth Harmon Kardon speaker. PlayStation 3 with several games. We had such a lovely time at this beautiful lake house; it was well and thoughtfully appointed. Plenty of space for everyone - adults and kids - to find a private spot, and well-designed communal areas to come together. Water view is breathtaking, and the dock complete with red canoe couldn't have been more picturesque. Highly recommend in any season, including a winter getaway weekend that was cozy and relaxing for us. We look forward to coming again and enjoying more seasons at Driftwood Cove. White water rafting on the Nantahala River. Choose from over 20 outfitters on the river. Fly fishing in the nearby rivers. Hiking on the Bartram and Appalachian Trails. Zip Line/Canopy tours nearby. Harrah's Cherokee Casino and the new Cherokee River Valley Casino in Murphy is nearby. Snow ski at nearby Maggie Valley. Waterfall sightseeing is within a few miles and several are right on the lake.